The first hole, Worry, features a windmill with blades shaped like question marks, because when you are worried your questions get in the way. Next, they progress to an intricate, par-40 maze that literally spells out the word “Frustration." After Frustration, they tackle Insecurity where they must putt while standing on a wobbly seesaw platform. The halfway point of the course is Depression, where players stand amidst curtains of drop-shaped beads and putt up a super steep ramp. If they do not sink the putt in the sideways hole, the ball rolls back down into their feet and they must fight the uphill battle again. Depression eventually gives way to Despair, a circular green where the hole is perched atop an inaccessible cylinder, and players are left wondering if there is a way to succeed. Next, players encounter Boredom, a long green composed of straight, narrow sections. Boredom has no real obstacles, challenges, or tricks to get through it faster. The following hole, Anxiety, presents players with the opportunity for a hole-in-one… as long as they are good at being “on edge.” If not, then the ball frenetically bounces around the doweled sides, settling far from the hole. The final hole of this exciting course is Relief, where players are treated to an easy hole-in-one. Players add their scores to see if they are "Like a Rock," "On the Brink," or a "Total Basketcase." 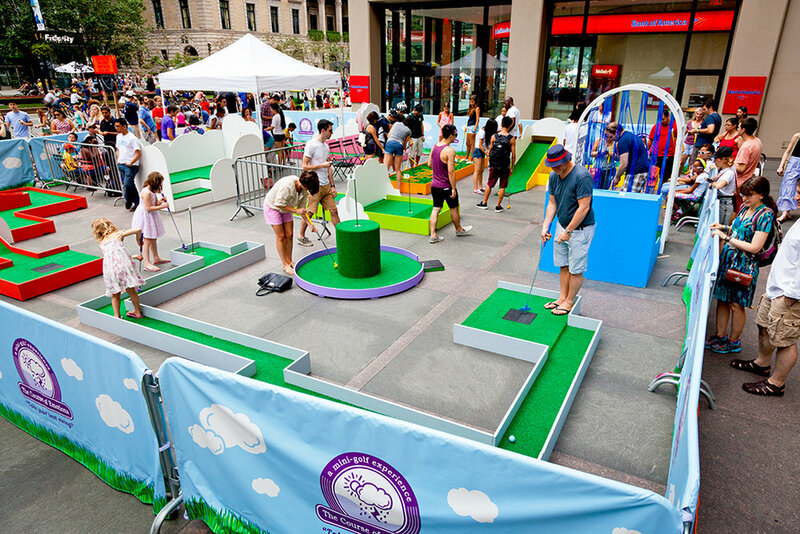 The Course of Emotions: a mini-golf experience was a fully-functioning, 9-hole miniature golf course, where each hole presented a different emotional obstacle, like: Worry, Jealousy, or Anxiety. The Course of Emotions is a fun way to look at challenges that everyone faces, and it gives players a rush of exhilaration when they are able to overcome them. 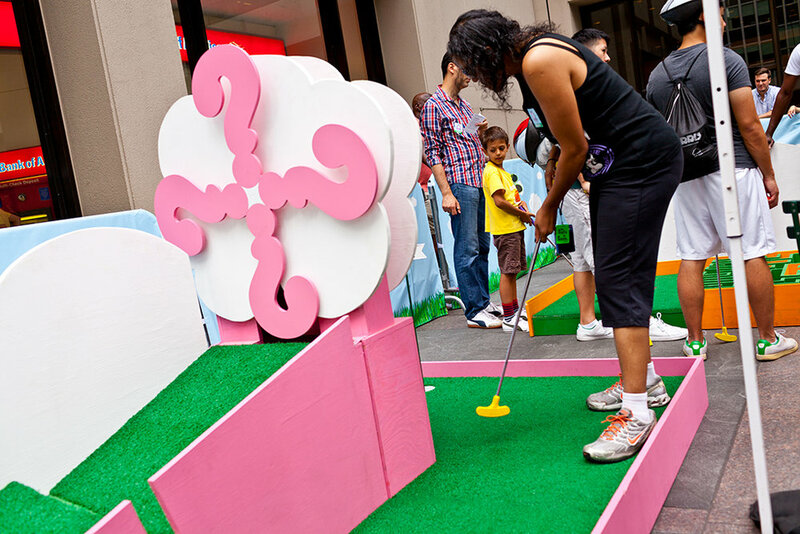 Using the kitschy miniature golf format, it allows people to tackle the emotions together, transforming an individual experience into a collective one. This version was commissioned by the NYC Department of Transportation as an art installation for Summer Streets 2013 and 2014. It features many of my favorite concepts from the first course, plus some completely new hole designs and challenging obstacles. news > events/exhibitions : "The Course of Emotions @ Summer Streets"